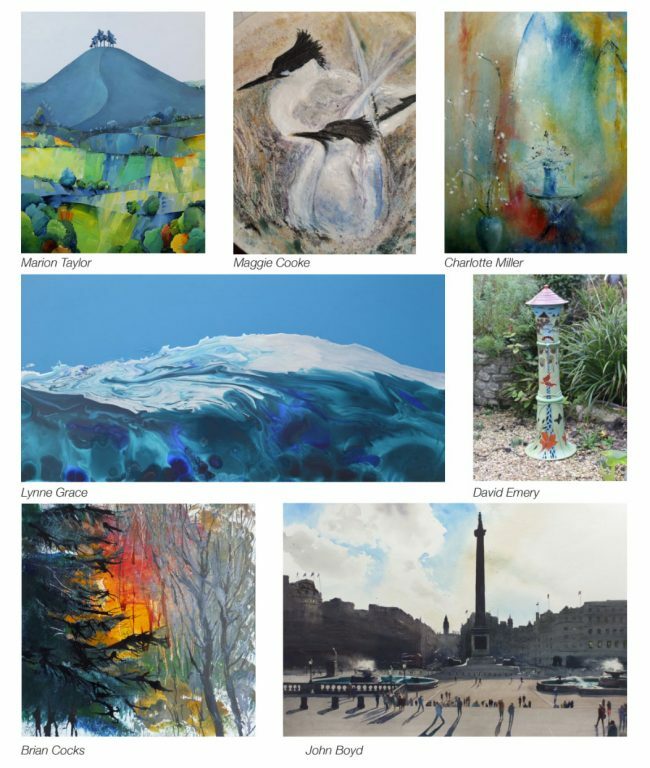 Meet the Artists on Saturday 8th September. All seven artists will be there. atmospheric paintings. Working in oil, watercolour and mixed media. 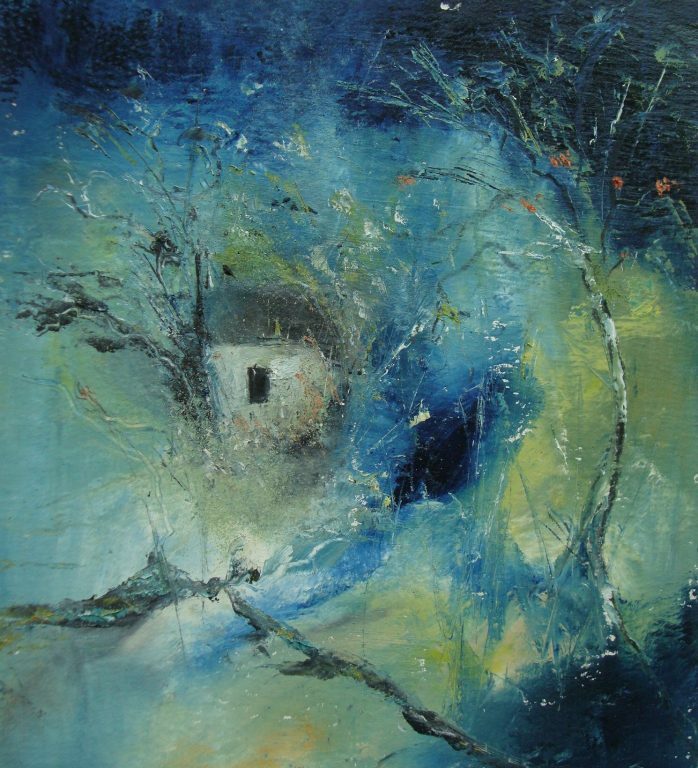 using mixed media are inspired by the local landscape and coastal paths. ceramics. 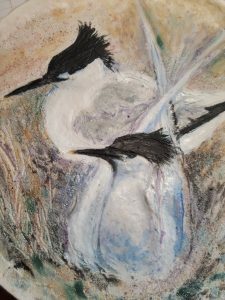 Maggie gathers inspiration from nature, wildlife and the coast. either with tree forms appearing to glow or the varying effects of light. 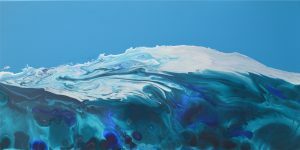 Lynne Grace: Lynne’s vibrant and experimental paintings reflect her exploration and fascination with the landscape and through the medium of paint she creates a world of her own making using memory, imagination and experience. Hand painted cards available. Directions out of Bridport on A35 towards Honiton, take left turn signposted Eype. Ignore Higher Eype and take second right signposted The Beach. The exhibition is on the left after a very sharp right hand turn. Parking outside the Church. Artist, Maker Stephanie Buttle uses diverse approaches within her practice influenced by her former professional experiences within dance, performance and lens-based mediums. 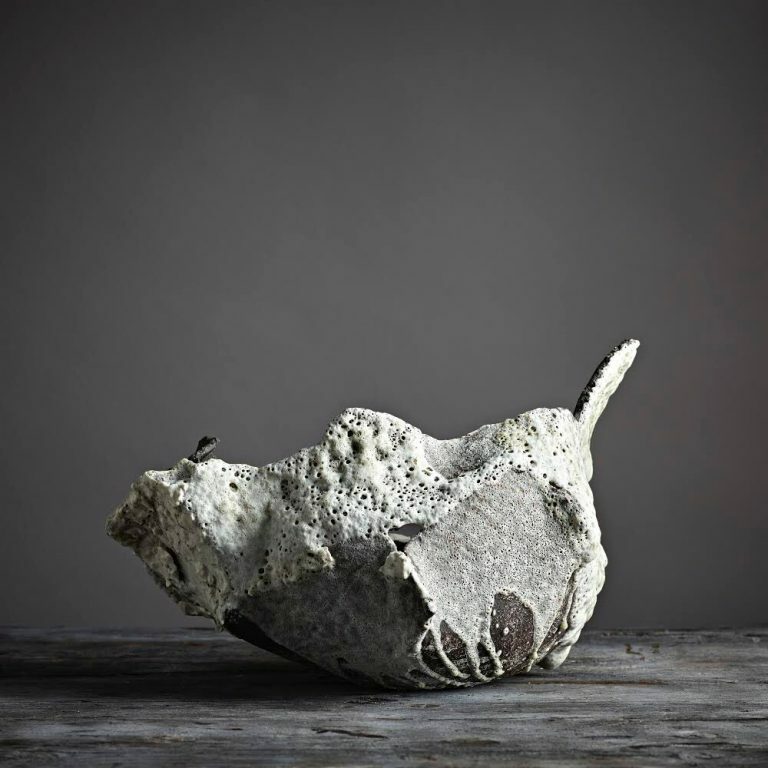 The material qualities of clay and the contrasting processes available within ceramics, act to express the artist’s fascination with the politics of intimacy and the discovering and presenting of an experience that often includes a performative element and a personal physical component. Stephanie studied at Central Saint Martins from 2012 -2015 gaining a first class honours degree in Ceramics. She was nominated for Central Saint Martins Graduation Nova Award. 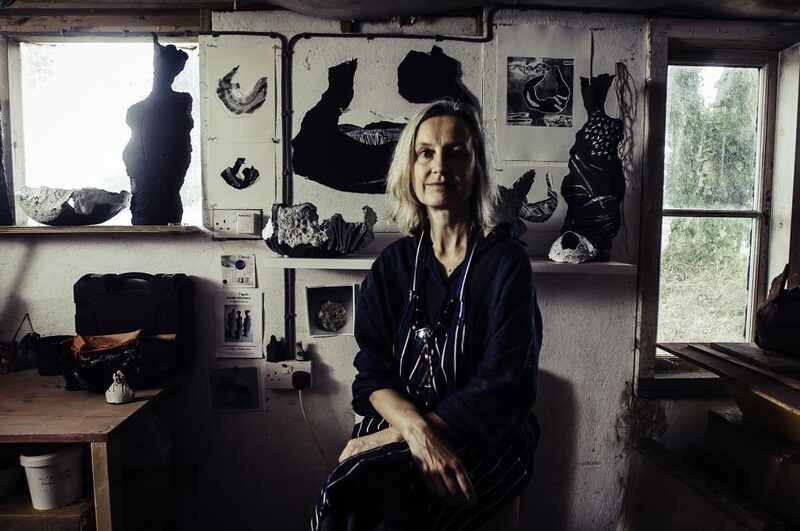 In 2016/17 she was guest speaker at Ceramic Art London, Featured articles in publication including Hole&Corner magazine and exhibited at the Lethaby Gallery London, Pangolin Gallery London, Messums Wiltshire, Port Elliot Festival in 2015 -17 with Hole & Corner Magazine and performed at the London Design Festival. Prior to attending Central Saint Martins she danced with the National Ballet of Portugal and appeared in Pop videos, for the Pet Shop Boys and Mike and the Mechanics. Acting credits include supporting actress to Juliette Binoche and William Hurt in the feature film ‘Couch in New York’ Director Chantal Akerman. She has directed short films, including, Throwing my weight around, 2015, Wet Man, 2004 and Fourth Wall, 2004 and a number of commercials and Pop videos. 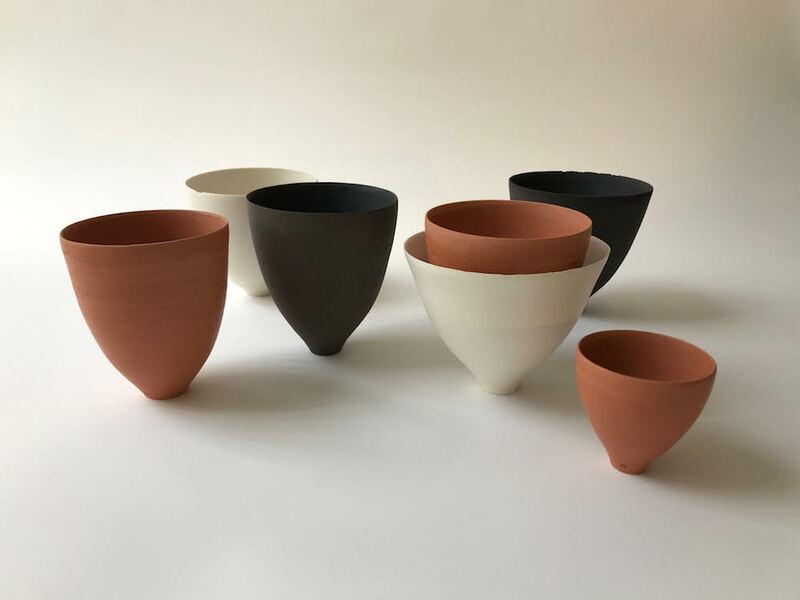 As well as her ceramics and performance work, Stephanie currently tutors in Ceramics at Morley College, London and for the outreach dept at Central Saint Martins. Stephanie lives and works in London. 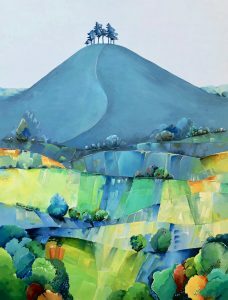 Boo Mallinson’s paintings act as a visual diary and a way of recording her everyday walks and journeys through the landscape. 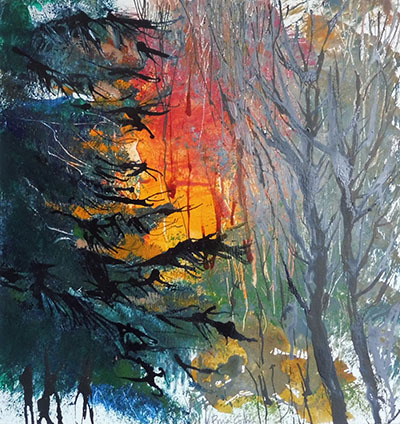 Memories of a repeated walk along a known pathway, the dramatic changes of light and colour from one moment to the next, the distant horizon, the way that sights, sounds and smells come together to form a very strong sense of place – these joyous encounters with the natural world form the starting point of her paintings. 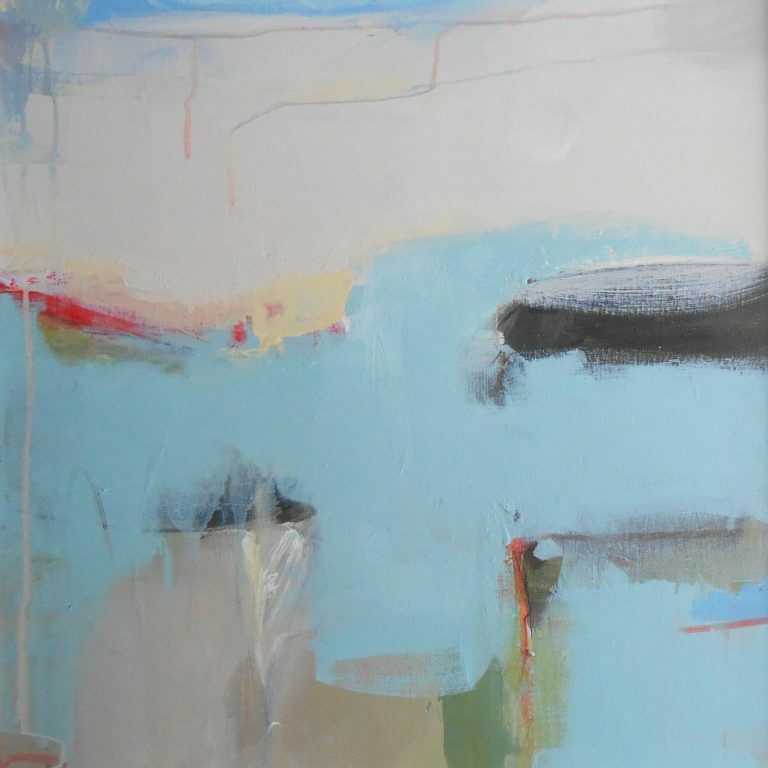 Once back in the studio, the translating of ideas and memories into paint enables Boo to explore colour and abstraction and to move intuitively between the real and the imaginary. 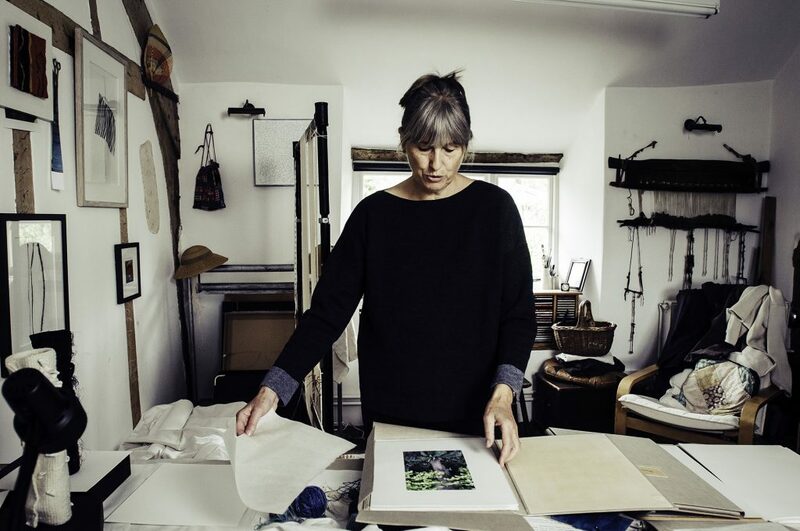 Jacy Wall – Her is about textiles in the broadest sense, exploring many qualities of woven, printed and stitched textiles, enjoying a seam and simple stripes as much as rich embroidery as a source of imagery to play with. We’re looking to fill 2 roles this year: an Assistant Director and an Event Coordinator. The Assistant Director is expected to take a lead role in managing the event, while the Event Coordinator is the main liaison agent with all our collaborators (artists, advertisers, designer, map-maker, printers, etc.) but both roles require initiative and commitment to delivering the event. Duration of roles: late-May to early September 2016. Times: 2 days a week for 13 weeks (can be split into ½ days if viable with the BOS Team). Work days will need to be coordinated, as the event requires close collaboration between the various members of the BOS Team. Please provide your calendar of holidays, child-care and other part-time work over the May to September period. Pay: £7.20 per hour at 8 to 16 hours per week. Please Provide: Your C.V. plus Personal Statement and indicate which role you would prefer. 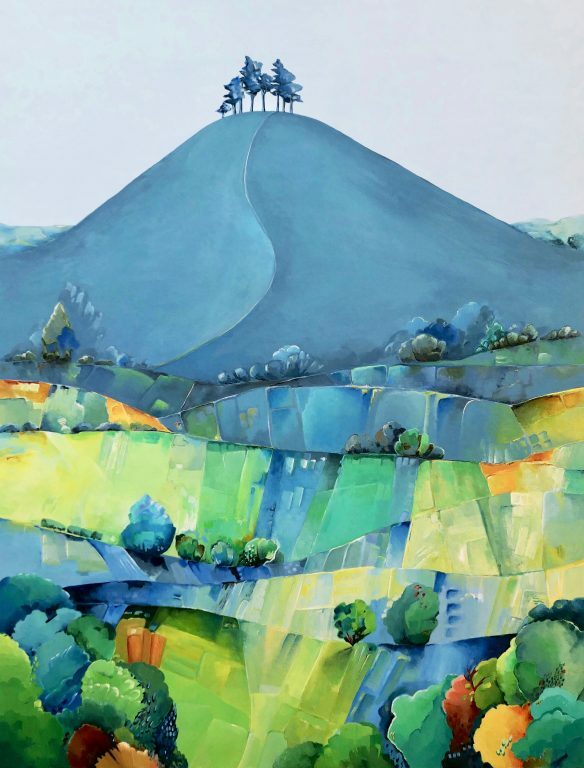 To plan and successfully deliver Bridport Open Studios working as a Team with the Director, Assistant Director, Event Coordinator and Designer, while liaising with participating Artists and Advertisers. You must be able to give 2 days a week (16 hours) and to be flexible nearer the event (20-29 August 2016). This job is particularly suited to people with experience of event management or administrative experience, but is also a great opportunity for recent graduates and those interested in gaining vital experience in Arts Administration and Management roles in the Art World. – Manage an Excel sheet of all Artists payment and chasing those who need to pay. 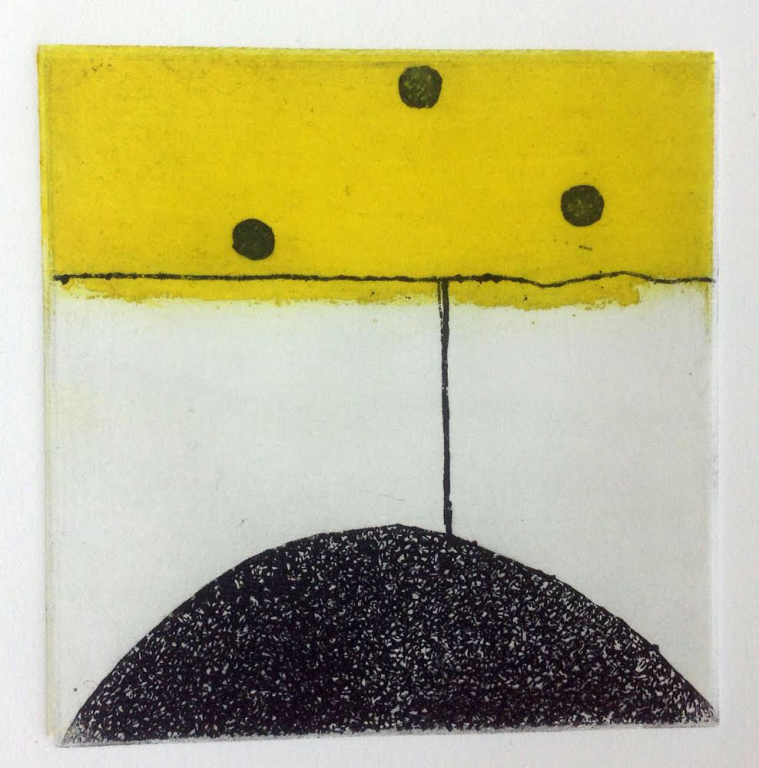 – Post exhibition – to ensure safe delivery of any unsold 6” x 9” sales back to St Michael’s Studios and for artists to be contacted regarding sales. 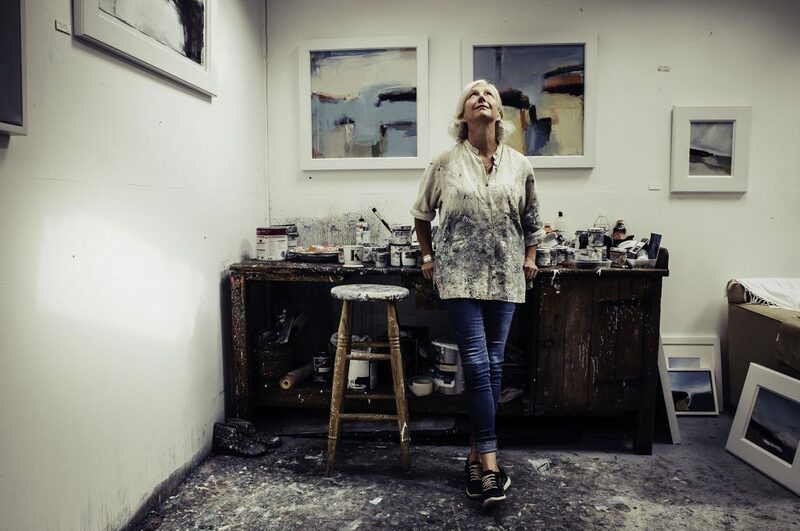 We went to meet artist Daisy Cook at her Private View at Sladers Yard Gallery, West Bay on Saturday 25th July. Sladers Yard will be Venue #9 in Bridport & West Dorset Open Studios. 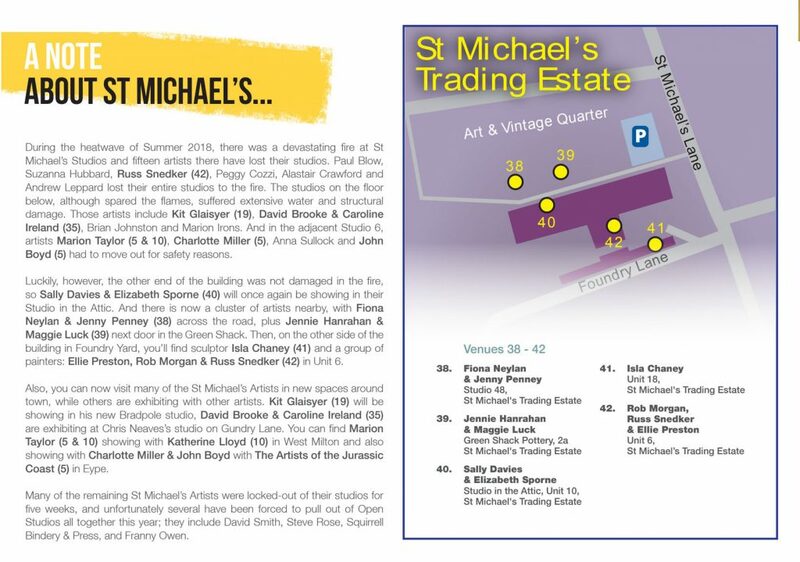 We’ve now finished designing the 44-page Open Studios Guide. Our designer Kate Gowrie has send the Guide to Creeds the printer early this week, then we’ll be receiving back our 8,000 copies sometime in early August. A PDF of the Guide is now available to read here: BOS2015-WebSinglePageView. Annalisa makes paintings and sculpture inspired by the natural world. Shown widely in the US, Ireland and UK, including the RA and the first Artist in Residence at Sadler’s Wells Theatre, London. 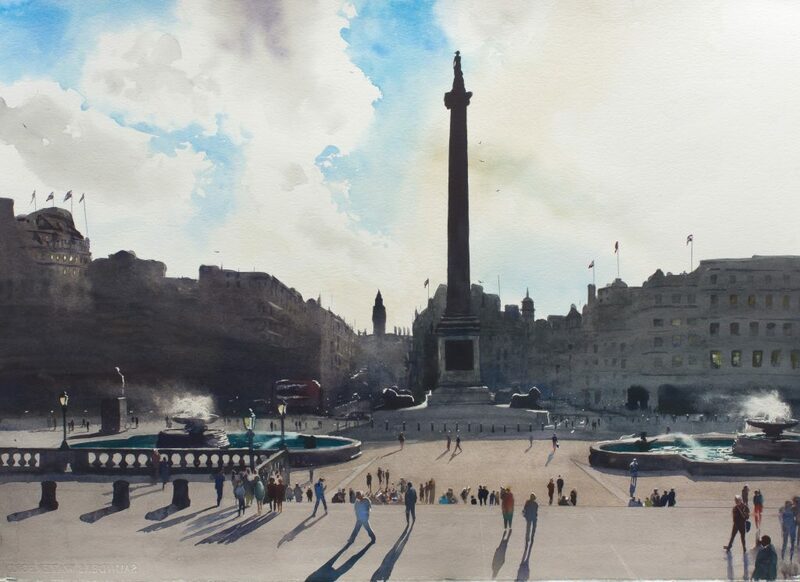 She studied at St Martin’s School of Art and Ulster University, Belfast. 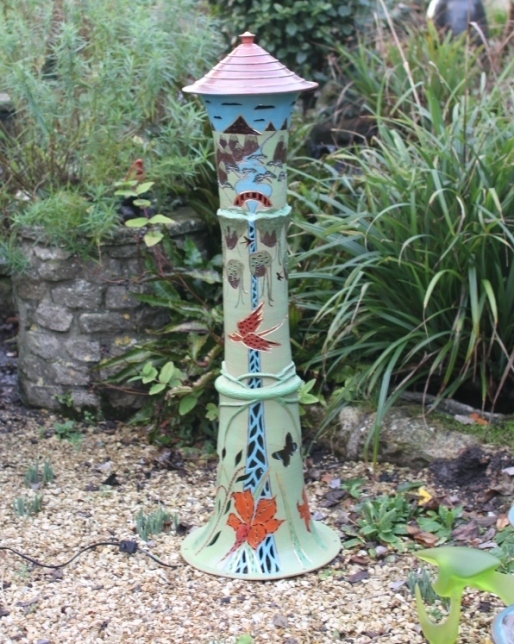 Studio Linnet Cottage, Chideock, Bridport, DT6 6JQ. From Bridport into Chideock, pass the George Inn on your right. 4 doors down on the left is Linnet Cottage, a thatched cottage with trees. Park in the entrance, or at the Post office. Jill works in mixed media. 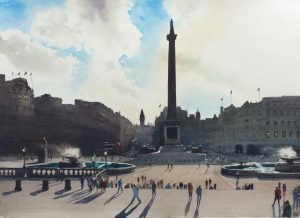 She shows a selection of oil, watercolours and charcoal. Themes include landscape and still life. From B3157 go through Swyre to Puncknowle. At phone box take Rectory Lane. From A35 go to Litton Cheney and follow the road past the White Horse pub. Take the left into Rectory Lane. From Burton Bradstock go East and fork left past petrol station. Take right into Rectory Lane. There is parking through the gate.